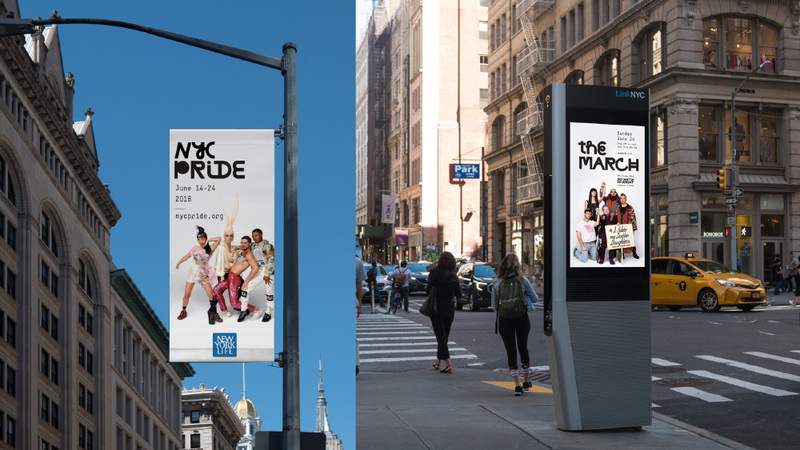 NYC Pride is the annual, week-long series of events in New York, NY, that celebrate the LGBTQIA+ community. All events, including the NYC Pride March, are organized by Heritage of Pride, a volunteer-managed, non-partisan, tax-exempt, nonprofit corporation formed in 1984, building on the work of the Christopher Street Liberation Day Committee, that organized the first march in 1970 to bring attention to 1969’s Stonewall Riots. 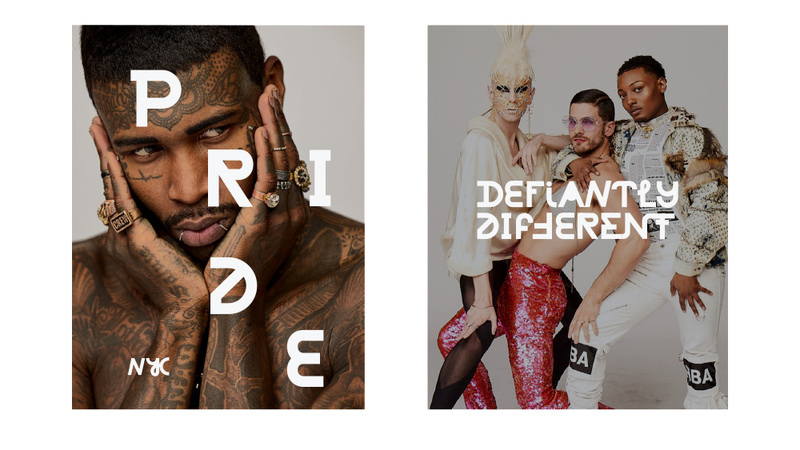 Celebrated this past June and attracting approximately 2.1 million to its myriad events and march, NYC Pride 2018 revolved around the theme of “Defiantly Different” with a campaign and identity designed by New York-based Grey in collaboration with art director Bryce Aviano. 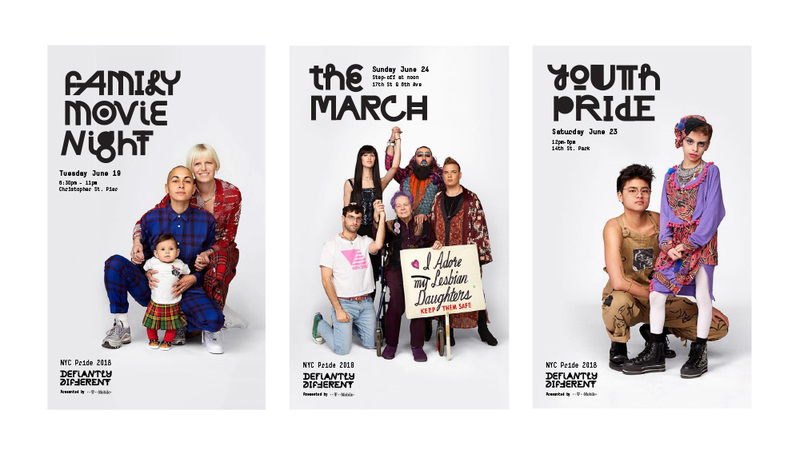 “Defiantly Different” speaks to the unyielding individuality within the LGBTQIA+ community, and stands as a rallying cry of generations who set the groundwork for equality, the next wave of members prepared to strive in new ventures, and each distinctive individual throughout. The creative showcases a wide selection of defiantly different community members. Part of this celebration was the creation of a custom dynamic typeface that holds multiple forms of each letter, representing the multifaceted diversity of the LGBTQIA+ community. 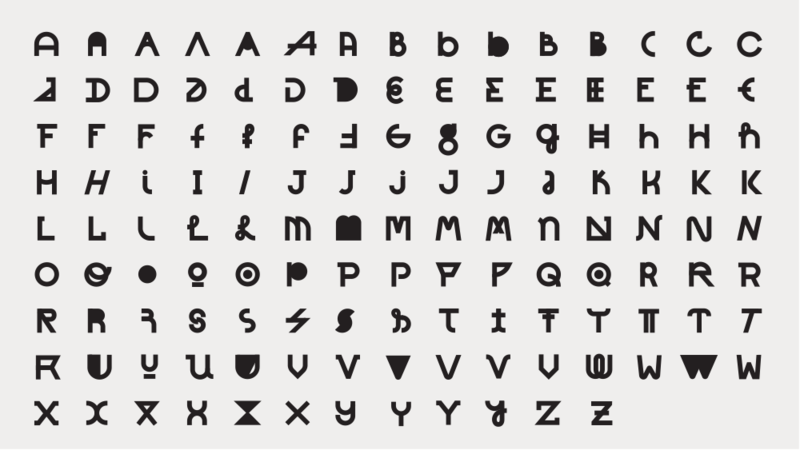 A simple unifying grid a was used to guide the letterforms and from there, a range of 3-5 forms were created for each glyph, allowing for each piece of typography to be as visually diverse as the people it is speaking to. The 2017 logo was surprisingly unexciting and could have easily been a U.S. Open tennis tournament. 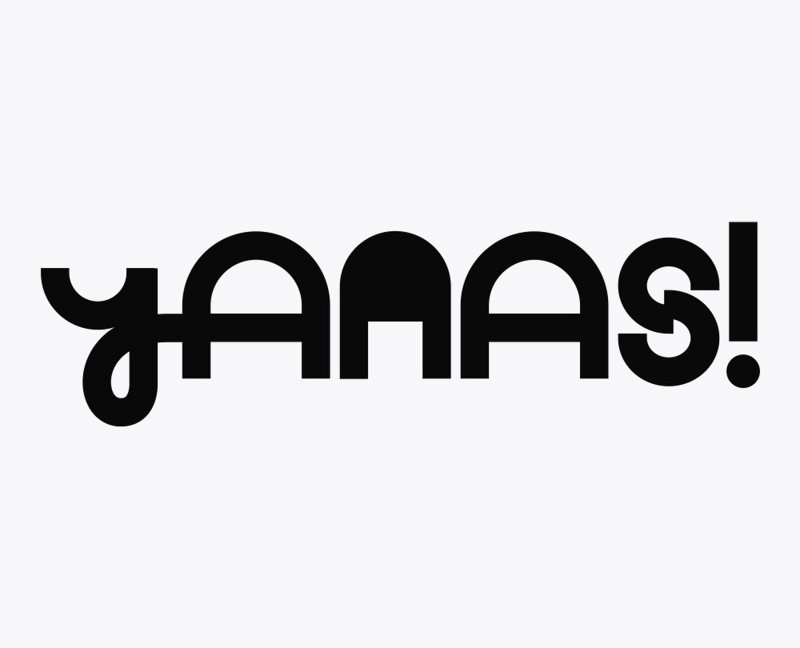 As if to make up for it, this year’s logo and identity swing to the opposite end of the spectrum with a wild identity built around a custom font that demanded plenty of attention. Not attractive in the traditional sense (or any sense) the font is successful in — as cliché as it may be given the context — its diversity. 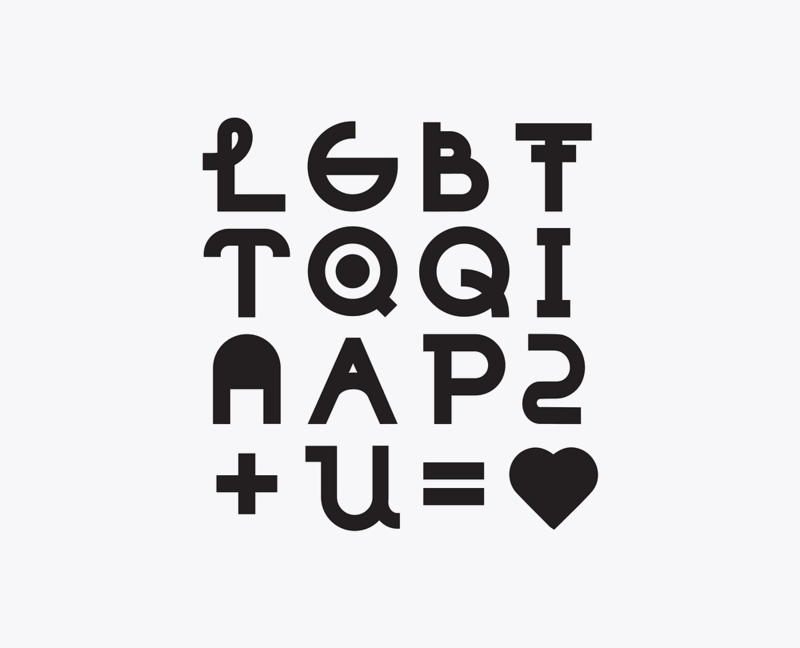 The variations of each letter demonstrate that the same letter can be straight, round, angled, weird, weirder, and/or even traditional… a nice, simple metaphor for the variations celebrated by the LGBTQ community. 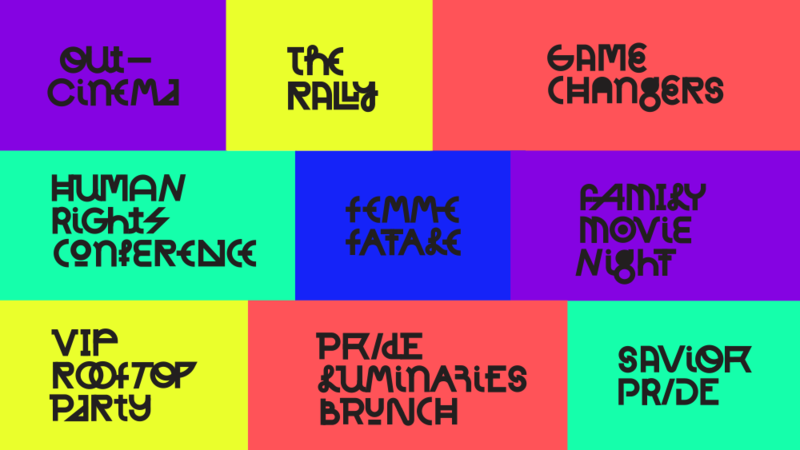 The event and theme logos work because, perhaps confusingly, they don’t work: They are awkward, weirdly balanced, and slightly hard to read if taken in without tolerance but, with a little effort, it’s all perfectly fine… and visually exuberant. Promos. Photography by Danielle Levitt. The identity isn’t just the weird font, which could get tired pretty quickly. To balance out the extroverted aesthetic of the font, the identity features some great photography that, shot against white backgrounds and focusing simply on the people, serves as a great, dignified contrast to the font, making for a strong combination of elements. At times, yes, it can be too much, as in the “Human Rights Conference” example somewhere in the middle of the collage above — that’s not something that you want looking like the lettering on the cover of a KISS album. Nonetheless, as a one-time campaign that spans dozens of events and has to stand out in one of the most visually noisy cities in the world, this was an arresting and well-balanced identity. NYC Pride is the annual, week-long series of events in New York, NY, that celebrate the LGBTQIA+ community. All events, including the NYC Pride March, are organized by Heritage of Pride, a volunteer-managed, non-partisan, tax-exempt, nonprofit corporation formed in 1984, building on the work of the Christopher Street Liberation Day Committee, that organized the first march in 1970 to bring attention to 1969's Stonewall Riots. Celebrated this past June and attracting approximately 2.1 million to its myriad events and march, NYC Pride 2018 revolved around the theme of \"Defiantly Different\" with a campaign and identity designed by New York-based Grey in collaboration with art director Bryce Aviano.